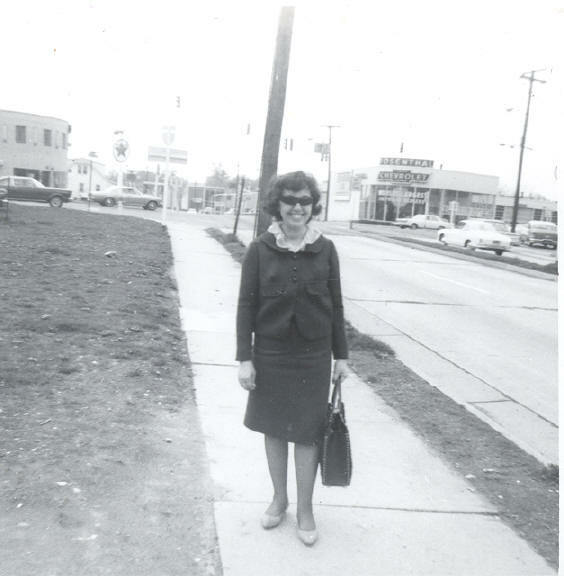 Mom Sylvia standing at the #10S bus stop on Glebe Road, 1963. In the background is Columbia Pike - to the viewer's left is Bauserman's dealership, and the Texaco station that pre-dated the Exxon. Nice cars in the background too -- Rambler?, Karmann Ghia, '57 Olds. To viewer's right- Rosenthal Chevrolet, built in 1954. This is STILL the #10 bus stop today (2004) -- and the #23 bus stops here, too. Back in 1963, the 10S would approach this bus stop from Columbia Pike. It would make a right on Col Pike and Glebe Road and then stop at this bus stop.